In resealable food-storage plastic bag, place mushroom caps. In small bowl, mix vinegar, oil, basil, oregano, garlic, salt and pepper with whisk. Pour over mushrooms; seal bag. Let stand 15 minutes, turning twice. Place mushrooms on grill over medium heat; reserve marinade for basting. Cook uncovered, brushing with marinade frequently, 5 to 8 minutes. Turn mushrooms over; cook 3 to 6 minutes longer. Top mushrooms with cheese and place burger buns, cut side down, on grill rack. Cook 2 minutes more or until mushrooms are tender and cheese is melted. 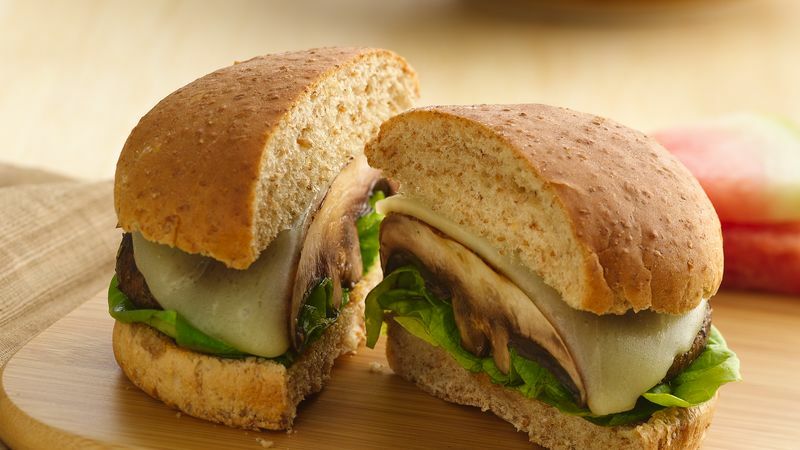 Serve mushrooms in buns.